The species of game to be found in the park include zebra, springbok, eland, gemsbok, impala, bontebok, duiker, steenbok, black wildebeest, tsesebe and bird watching. It is a 330ha eco-park, open over weekends and public holidays, 06:00 – 18:00. Entrance is free. It is perfect for hiking or a picnic in the park. A bird sanctuary lies behind the Highveld Garden, where up to 70 different species of highveld birds can be viewed. In the Vaalpark wetland, beautiful and quite rare swallow-tailed bee-eaters have been spotted. The resort offers swimming pools, water slides, a Putt-Putt course, a model steam train, game camp and play area for children. The river makes all forms of water sport possible. Caravan and camping sites, as well as chalets, are available for longer stays. A unique African adventure complex consisting of a Kenyan-style Hotel, Zanzibar Dome, Moroccan-style Souk and cultural village, an Aqua dome for children, Safari Lodges and animal world and a river resort. The 8 ha Highveld Botanical Garden, in President Brand Street, protects the indigenous plant life of the highveld along meandering paths and rockeries set among small ponds. This area is also a bird sanctuary. The Etienne Rousseau Theatre and the Public Library are both excellent examples of contemporary architecture. The Public Library won the Fulton Award for the best use of concrete and its auditorium is often used for art and craft exhibitions and music recitals. The Theatre seats 480 people and its orchestra pit is large enough to accommodate a full symphony orchestra. Oranjeville is situated on the banks of the Wilge River and is renowned for its water sports activities. It is considered an angling mecca for fishermen and hosts big national angling competitions. 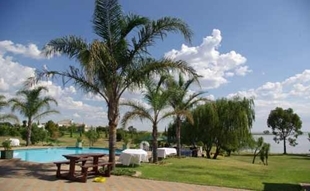 Oranjeville is also home to a large resort west of the town and situated on the banks of the Vaal River. Deneysville is a peaceful and sage village with a host of restaurants, a croc ranch, gallery and art and craft centers. It remains the largest growing town in the Vaal complex. Various water sports and boating activities are on offer, including. Around the Island Race and Sailsure Week. The Marina has accommodation in caravans or on a houseboat. It also offers yacht and boat charters and sunset cruises. There are picnic and braai (barbecue) areas, as well as a swimming pool on the premises. The biggest inland yacht race in the world, the Round-the-Island Race, is held on Vaal Dam, near Deneysville each year. 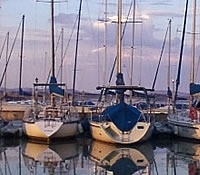 Lake Deneys Yacht Club hosts the race and approximately 500 to 700 watercraft usually enter; ranging from dinghies to catamarans and keelboats.